Children can be very particular about their dinnerware preferences. They have their favorite plate, fork and even bottle. 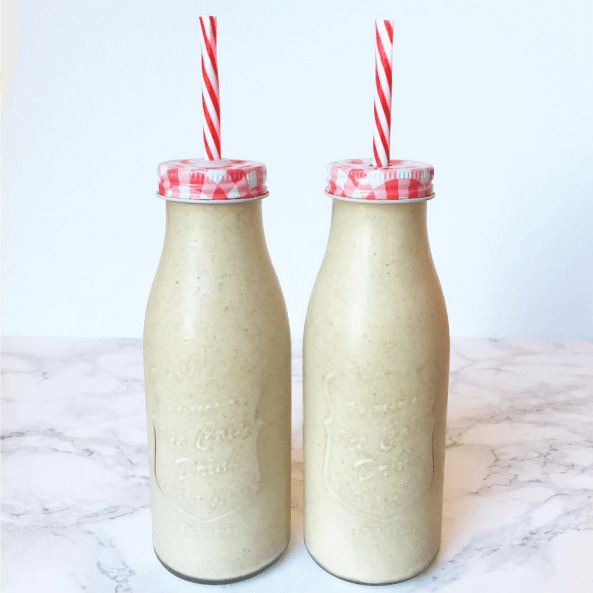 Here’s a simple and delicious shake recipe that goes with a very cute bottle and straw set by our guest blogger, Sara who among other things shares great recipes on her IG account – @atablefortwo_. –So, this morning I discovered that my little man will only drink shakes out of these bottles. You may have noticed a lack of shake posts on my Insta but we’ve still been having them – I’d just been lazy and serving them in the nutribullet cups which aren’t exactly photo friendly ha! But Cael wasn’t really drinking his. I couldn’t figure out what had changed and then I realised this morning it’s the bottle! Haha, he only wants to drink it out of this bottle! I love their assertive little minds so much! No more nutribullet cups Cael, I promise! Banana peanut butter caramel smoothies for mother and toddler. Made with superfood magic.